Electrical work for fans and lighting, as well as decorative columns, added to the overall cost of this front porch. A covered porch designed to blend perfectly with the house and the garden demonstrates how well a simple structure compliments the landscape. 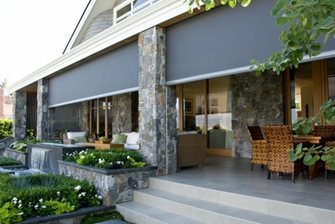 Screens make porch living bug free - traditional rigid panels are affordable, but high end homes may prefer these expensive automatic roll-up screens that can add shade during the depths of summer. This second floor porch features simple carpentry, rails and traditional screens, but it's the elevation that drives up costs due to hidden structural reinforcement. 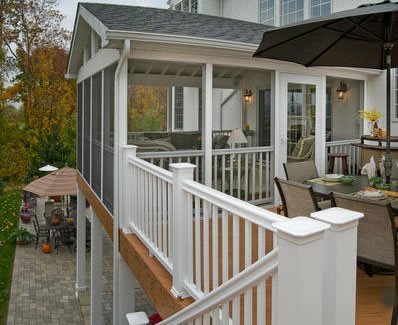 Adding a porch to your home is an affordable way to create outdoor living spaces on a raised foundation. It's composed of a deck, railing, steps and a roof, mostly built out of wood in a style that blends with the architecture. 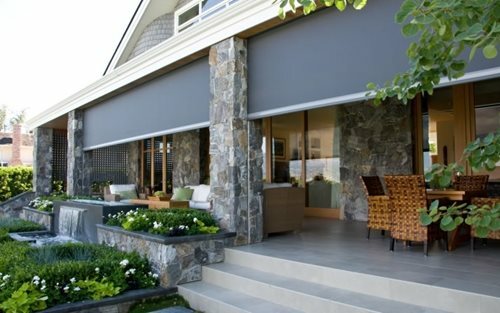 The cost is directly tied to the size of the porch and to a lesser extent to the materials and detailing. For example, a porch with special railings, or one that features lighting or even a ceiling fan will require an electrician as well as a carpenter. Because a new porch is directly tied into the house itself, a contractor is essential to ensuring a quality job as well as safe design. These structures are most often built of wood, but some involve more complex design and materials such as stucco or when stone veneers are integrated into the foundations. 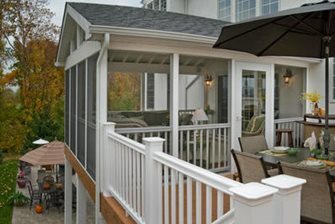 There are also kits that offer screened enclosures that sit on top of a deck turning it into a roofed screened porch. $70.00 per square foot for a high quality project with electrical and skylights, a solid roof and fully screened. The following bottom line cost averages are based upon a raised deck, shingled roof and traditional railing constructed to code using standard lumber. 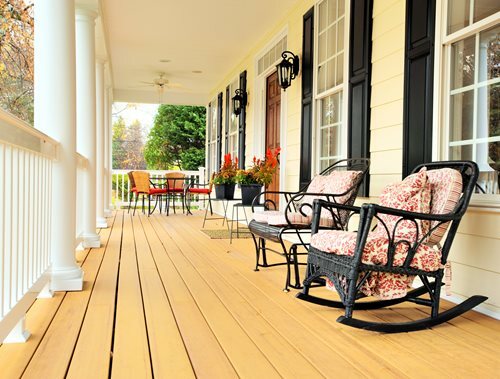 Other Cost FactorsElevation: A porch connects the finish floor elevation (FFE) with that of the surrounding ground plane. Homes with a higher FFE may require structural calculations and more extensive foundations, particularly if the ground plane is on a slope. Lighting: The porch must be wired with 110volt outlets to accommodate lighting, ceiling fans and other amenities. This may require subcontracting to an electrician. Climate and Footings: In the northern states, footings for the porch must extend to below the frost line. These may prove more expensive to build due to the additional labor and materials for deeper and possibly more extensive footings. Roofing: If your home utilizes roofing tile in lieu of shingles or composition, it should extend over the porch so they become a single, integral structure. Tile is heavier than other types of roofing and may dictate more extensive or larger rafters to accommodate the additional weight. 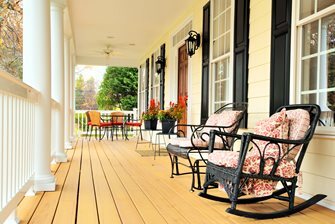 Custom Railings: Front porch railing choices impact curb appeal. Rather than a hand built wood railing, many contractors prefer to use tubular steel railing units that are more light weight, easier to install and do not decompose. Specialty Posts: Contractors create specialty posts for vintage homes or those new houses that reflect nostalgic styles. This may require boxing, turning or Victorian gingerbread details, all of which increase costs.